It's already pretty ridged to be fair, should be fine to mount the controller on. I'm still testing my LiPo bricks and researching how to bulk charge. I think a couple of Meanwell 48v power supplies trimmed down to 41.5v each in series might work from what I've read, but need to do more research to be sure. I'll also need an easier way to get the packs to storage voltage as it'll not be in use everyday. I take it 12s is what your going to run the meanwells are used to good effect with a bms. Discharging is easy enough, get a load of 60w car head lights bulbs, 4 in series and 10 parallel gives you a cheap as chips 2400w load at 50v it will pull 50amps. Just remember ohms law and you can't go wrong. There always digital loads and dump resistors in oil baths etc but head light are cheap as chips and perfect for occasional use. I like the gas gas alloy frame good heat sink for the motor dumping it's heat by the looks of it your ride will be hungry for the amps so get some high discharge lipos or parallel up some multistars what your plan on that front. I've gone for 10,000 mah 20s Lipos Multistars, not planning on using a BMS for discharging, might use one for charging. I doubt they'll give enough amps so I'll have to get another 5 bricks and run them in parallel. Going to charge to 83v. Others who have ordered from Eastgem have had similar experience with weeks of slow shipping and uncertain communication. The stuff always shows up though so I'm sure you'r fine. Never heard of them ripping anyone off. I use two meanwells with the Fechter Current limiting boards to charge 20s to 84v. Its about 6 amps. There are lots of meanwells on the market that do current limiting now so the need to rig up those current limiting boards is becoming less common. You can run chargers in parallel too so buying 2 of the common ebike chargers is not too bad of an option. As far as storage voltage goes. It doesn't take too long to blast 20%-30% out of a pack. You don't really need a discharge solution. Just don't charge until right before you use the setup. If you store a 10ah pack at 70%full it only takes 30% of an hour to top it off at 10Amps. So plug it in while you gather your gear and get suited up and you probably be close to full. There's a nice 24s 300amp lcd bms with a speedo dash, temp monitor, individual cell monitor and Bluetooth. Search 24s 300a lcd bms. Bms on discharge is not 100% needed though I've run naked packs and just monitored the overall voltage, current and watthour with a cheap 120v 300amp bluetooth shunt just made sure to balance charge never go below 80% capacity or leave standing with over 80% ". Like Dan said though I've never used a discharge load myself never needed it normally I have to top back up to get storage charge. What pitch chain does the bike use 428 sprockets will be massive to get good torque advantage the rear sprocket of a 54 tooth is like 11 inches wide big old sprocket. Thing to keep in mind when ordering from china is the shipping time, anywhere between 4-12 and even 16-18 weeks are normal. Some shipping agencies will take various bulk cargo for cheap shipping rates, but they collect goods until a container is fully loaded before they place the container onto a ship. Worst case it can take 8 weeks just to fill said container, then another 8 week at sea and a week or two getting handled when arriving at the dock. I find that only way to ensure not ending up with such a long drag for shipping is to be aware when ordering and choose whatever express shipping options they got. Even if the price seems high for express it will radically reduce the time of travel for the goods. If you didn't explicit choose express at check out most likely your cargo is moving but slowly. It can be hold up waiting for a container fill up, custom papers, etc. And the sad thing is you rarely get any tracking number or updates before the cargo leaves the dock close to your destination. So you can't see that the cargo is loaded onto a ship, can't check when they left Asia or ETA on reaching your shore. But this is normal and sadly about the only way to get really good price on over seas shipping these days. The company you placed your order with is known here at ES so I am certain they hold up their end of the deal. They can't give you any updates because they don't have any before shipment reaches your country. It currently uses a 520 chain but I'll be free to change. 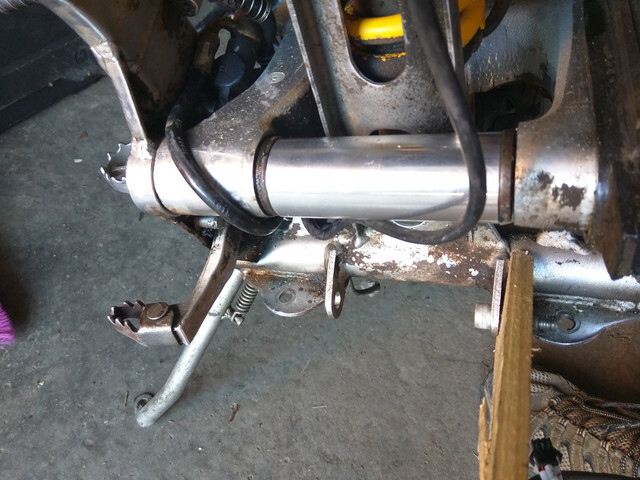 I might change to use a secondary reduction later down the line, I'm just trying to keep as simple as possible at the moment and having a massive rear sprocket won't bother me too much. macribs, thanks for the reassurance, there wasn't any options that I recall for faster shipping. I'll just have to wait. I thought I'd read on here someones motor arrived after 10 days and assumed that was the norm. I'm in EU/UK so buying from USA might take just as long. * EDIT * Had contact, it's been a Chinese holiday again, now got a tracking number. It's at Heathrow awaiting customs. Hope it gets through without import duty. I'm currently working on the motor mount and waiting for the 70t sprocket to arrive. Motor mounted with bits of scrap for now. Hopefully my 70t rear sprocket will arrive soon along with the new 428 chain and I can get the wheel spinning and have a see how it runs. What's that throttle bigpie have you made a throttle Box up to attached a cables throttle or it it an electric jobby. I like where you went with the motor nit sure in its kv but it look like it got some serious grunt and being an inrunner I have a soft spot for them I'll be watching this one wishing I was making something similar. I couldn't get an answer as to its KV but I went with it any way. It's almost 9kg so hopefully that means it's got some grunt. The throttle is http://www.eastgem.net/throttle-adapter.html my rear sprocket should be here in next few days and I'll have a turning wheel and a little test. 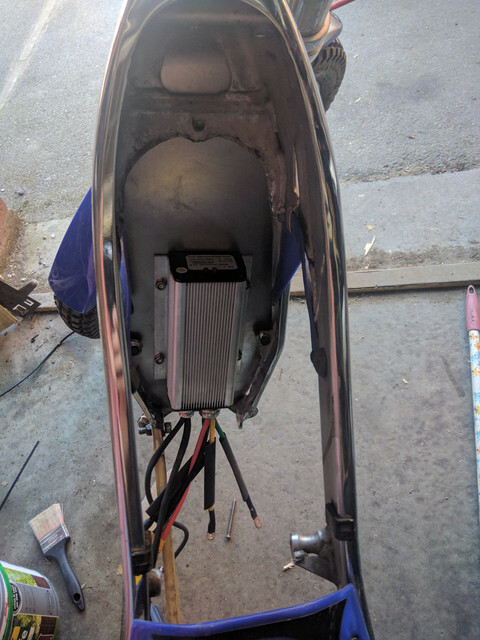 I like the throttle box, with the trial bike it's got to have a decent action throttle in your hand to blip and I'm sure this will rev up nicely the phase wires look meaty. How have you a manged to gear it without knowing the kv, Ita gonna be bit of a wish for the best cross your fingers moment ? It will run for sure that thing will twist the frame up with torque but what top speed you gonna be hitting for the voltage applied ? from your pics i take it you got the 7.5kw model the kv is the same on the smaller 4.5kw model too. Looking at the page it's around 62.5kv and can max out at 200amps plus for the big boy version so that's gonna need some serious battery pack to run at max settings but it will also kick some serious arse. Last edited by Ianhill on Apr 29 2018 4:14pm, edited 3 times in total. It's a bit of a stab, but it says the max rpm is 4500 so I've used that to try and gear it under 30mph. The reality is that I cannot get a bigger rear 428 than 70t and I've got a 10t front, so I've gone with that to see how it feels. If it's not puncy enough I'll have to look at yearling the controller parameters or adding a secondary reduction. I'm probably not going to hit the bullseye on the first go, but hopefully won't be too far off the mark. What's the rear tyre your using ? MICHELIN TRIAL COMPETITION 18 inch I believe. I was going to try give u a ruff estimate of where u was at speed wise, the overall circumference of the wheel I need I can get that from the diameter of the wheel the full width or the radius which is just half the width. Im really liking this build it's perfect for my area plenty of trails and steep inclines etc I like the way you went with the motor it's going to take a beating and love it. What power settings was that at bigpie ? What ever was already programmed in to the controller, I've not yet played around with it. My motor alignment is still a little out so it's still a bit noisy. Hoping to get it hooked up to the laptop at the weekend and play with the settings a little. I might want to increase the gear ratio, but for the moment it's ok. I've only got 5 of the multistars hooked up, I need to get another 5 and parallel them next. Can't get a larger rear. The 70t is the largest black sprocket available in 428 apparently. I'd maybe have to get something cnc'd or change chain pitch. Motors got a really strong pull, I'd like a bit faster initial ramp up if I can. Any joy over the weekend on tuning it ?, I take it your using the smallest drive sprocket you can find too. I've not had chance yet. I think I might be able to go down 1 more on the front with off the shelf parts. I'll get a larger rear CNC'd if I need one, just need to learn how to do sprockets in fusion 360. I've got to finish mounting the battery packs before I can give it a good test.